No one is going to convince me that I will ever get bored of taking pictures of ladybugs on crocus flowers, I’m sure of it. Some people in my proximity comment on my seemingly endless stream of ladybug pictures (I have to say it is not endless, I’m nearing the end of my archives soon) and say I should look for something else. I would love to, and honestely I have, but there is no proper replacement available. 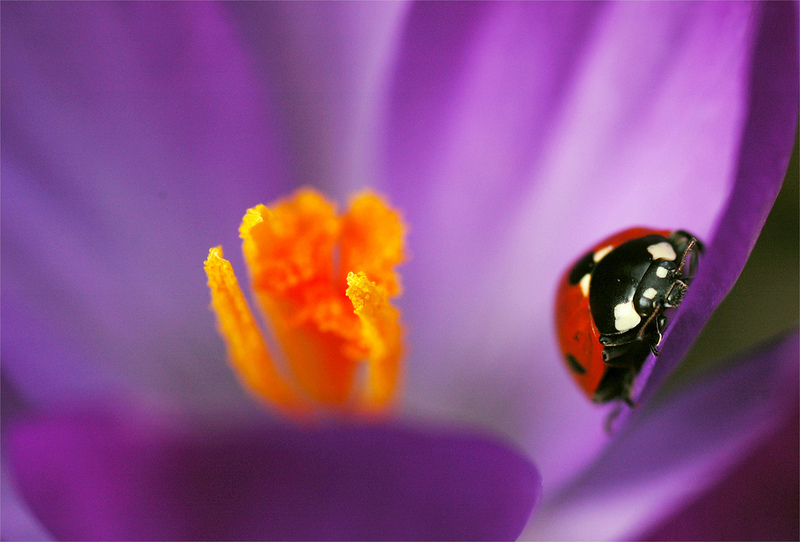 Neither the crocus nor the ladybug have good substitutes available where I live. I spend most of today taking pictures of house sparrows to get a nice cover for my report on them. I couldn’t help but think ‘why can’t sparrows be more easy to handle, like ladybugs’ or ‘why is that beautifully coloured tree not fuller like a crocus so I can’t see there is a house behind it’. Ahh well, maybe I do find replacements when spring starts. If not, ladybug on crocus it is. This entry was posted in Photographs and tagged beetle, crocus, flower, insect, ladybird, ladybug, macro photography, photography, purple, spring. Bookmark the permalink.